The El Borracho is the second line of cigars released from Dapper Cigar. The Mexican San Andres wrapper is a high priming leaf from Carlos Guzman's De Los Perros farm. From CigarNoise: "Ian Reith of Dapper Cigars said he wanted to do a take on the San Andres/Nicaraguan combo that Padron's famous for and thus El Borracho was born"
How'd it get the name? Small Batch interviewed Ian Rieth and got this story out of him - He was testing out cigar names on his Hispanic wife when she mentioned that some of them sound very similar to La Loteria games popular in Mexico. After looking into it and presumably crossing out the already taken names (Calaveras, Corazon, El Mundo, La Sirena ...) he settled on one that called to him "the drunkard" or "el borracho." 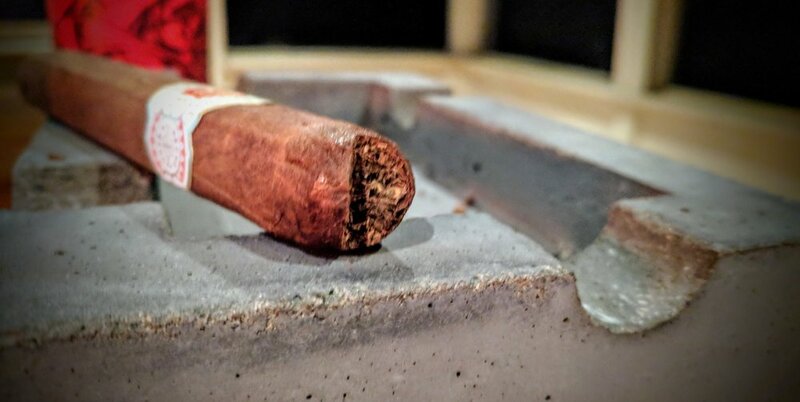 From the same interview, the blender notes "El Borracho is meant for the seasoned smoker who appreciates a balanced full bodied Nicaraguan cigar which gradually builds on the flavor profile and intensity." I love that Dapper, being brand new to the industry, decided to use their second stick to take on the powerhouse giant that is Padron - styling this cigar in the same fashion, composition of the infamous 1926 and 1964 blends. Also, I love that he made this one to hand out to his "elitist cigar friends." El Borracho's band is the work of Dan Greta and looks like a sign you'd see hanging above a dude ranch somewhere along the Texas-Mexican border. The ornamental yet minimalist design definitely conveys a distinct Latin American feel. The band uses a simple color scheme - a bold red, matte white and gold. As I mentioned in my review of Dapper's Cubo Maduro, Dapper likes to use a gold powder rather than foil to give the band's accent color a richer metallic pop. It's not easy and not cheap, so it shows the level of love and craft that they are putting into each facet of producing these cigars. Overall, I dig the El Borracho band - not as much as the Cubo - but the band lighter shade contrasts beautifully against the San Andres wrapper. It's a detailed design without be obnoxiously ornate. Well done again Dapper! The Mexican San Andres on the El Borracho is a silky, oily milk chocolate brown. The seams sit perfectly on the box-pressed body - blending in with the wrapper to the point of invisibility. There is very minimal veining and the couple that exist are barely raised. The cigar has a decent amount of given to it - although I'm hesitant to squeeze the box-press to hard. It does feel uniform from foot to cap. The seam from the cap to the body is basically non-existent. It's almost impossible to determine where the cap transitions to the body. It is a little lop-sided but has very deep shoulders that drop far into the body. As feet go, the foot on the El Borracho is interesting. It's almost an unfinished style in that a chunk of the wrapper folds over into the foot at one spot. There are also some very large chunks in the foot. I'll be curious to see how this thing lights up. The aroma of the foot and wrapper is an intoxicating blend of chocolate and leather. There is a little cedar lingering as well. It really smells fantastic. The cold draw brings out some cedar and dried apricot. There is a little sweetness from the dried fruit taste that sits on the lips. The draw itself is fairly snug but a good resistance. Wow. The El Borracho starts off fantastic. There is zero harshness on the first few puffs. The initial flavors are deep creamy chocolate with a little cedar and apple pie type spices (think cinnamon, nutmeg, clove). There is just a hint of pepper that lingers on the palate, less as a flavor and more as a tongue sensation. The draw is damn near perfect. You really cannot ask for more - a good amount of air moving through on each puff with enough resistance to make it worth it. The initial burn line is wobbly but so far it's not something meriting a touch-up. Those 'interesting' features on the foot led to it taking some work to light evenly. The extra wrapper and chunks caused it to catch unevenly. It's not a ding against it, just took a little extra effort to get it going. The ash is a very light gray color and it's trying hard to stack dimes. Unfortunately, there is a cavern in the side of the ash and it's likely going to drop a little early. This thing is smoking way too smoothly. The first third is punctuated by a continuation of the initial silky cocoa/creaminess paired up expertly with some leather and cedar to offset the sweetness. There is a little stone fruit that sits on the back of the palate as well and is really accentuated on the finish and retrohale. The retrohale is very smooth and brings out the cedar and fruit. The burn has perfected itself with no extra fire. The draw and burn are top notch. The ash flayed out and then half fell off before finally all dropping off. Now that that's out of the way it's stacking up perfectly. The chocolate that dominated the first third is giving way to some meatier, light pepper-laiden flavors. There are also some really interesting bread notes - kinda like a good, made-that-morning pumpernickel. The retrohale fires out some pepper and really makes it pop on the back of the tongue. 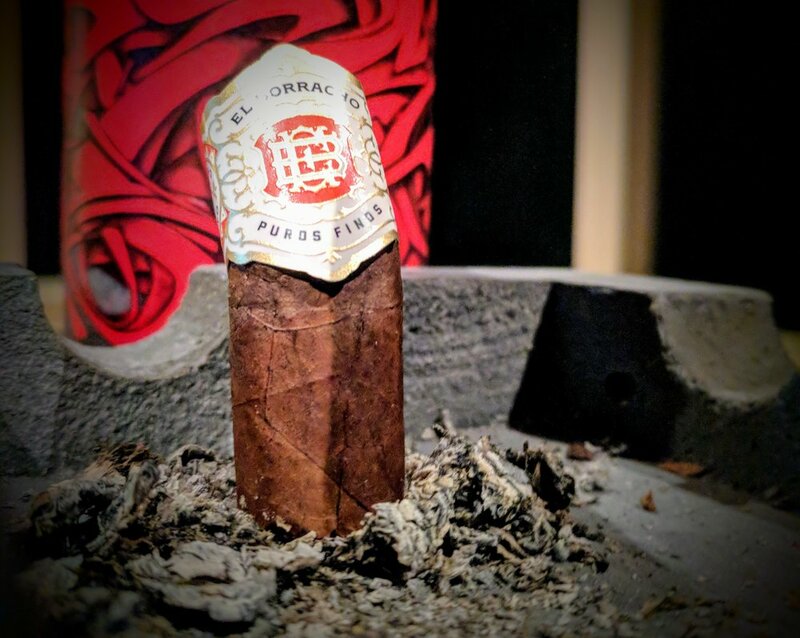 To circle back to the pepper - it's really interesting and maybe the best pepper flavor I've ever experienced in a cigar. It's not like crunching into a black peppercorn. It's much more just the zing on the palate minus the spiciness. It's super interesting and you really need to try it out since I'm not exactly sure how to explain it. As great as the burn had gotten, it's jumped the rails at about the midpoint. There is a massive, wave-like portion of unburned wrapper. I'll let it go for a bit to see if it burns out and corrects itself. The ash is really building fantastically. The color has darkened significantly to a medium gray with layers of black interjecting irregularly. The final third switches up the flavors yet again - seamlessly moving to a charred wood (oak? ), smoked almond along with a lengthy finish of some dough and strong black coffee - truly a dynamic finish. The draw has been completely perfect throughout the smoke. The burn line issues presented in the middle third were alleviated with some careful resting and naturally corrected itself. The burn line to the end is razor sharp. The ash is one of the real downfalls of this stogie. It's not a huge deal but worth noting that the ash was plagued with various issues throughout the experience. It flaked off irregularly and was a pretty messy smoke. Random chunks would fall off and various moments as well. Just weird from such a great cigar otherwise. The El Borracho was like a great meal - each course clearly defined and shifting from flavor to flavor effortlessly. The flavors tied together beautifully and each was complimented by a prior or later tone. Each third was well-balanced and lent itself to a great, even-keeled experience. The burn on the El Borracho was erratic but always seemed to find its way. There were various moments that made me nervous but with a little attentiveness to how the cigar rested between puffs, it always came around and fixed itself. Dapper has really brought their a-game with el borracho. for such a new company, they really seem to have perfected the finer aspects of the industry. the drunkard excels at delivering a multi-faceted flavorful experience backed by a solidly constructed stogie. 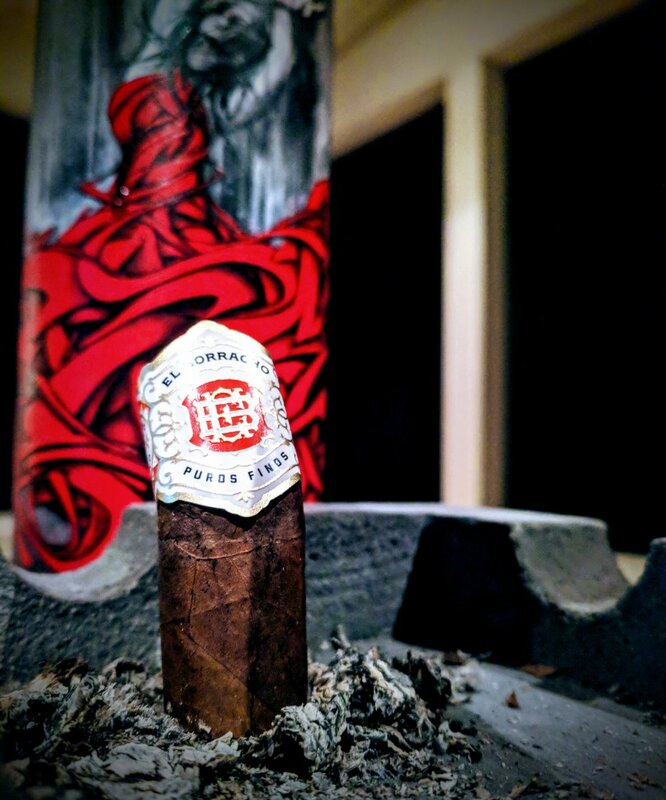 never boring, el borracho brings some unique flavors to the palate and has certainly earned a permanent spot in my humidor. Looks like Dave and I are on the same train whereas the guys over at Developing Palates feel it's good+ - their rating system is very unique and really interesting but quite different from traditional formats. 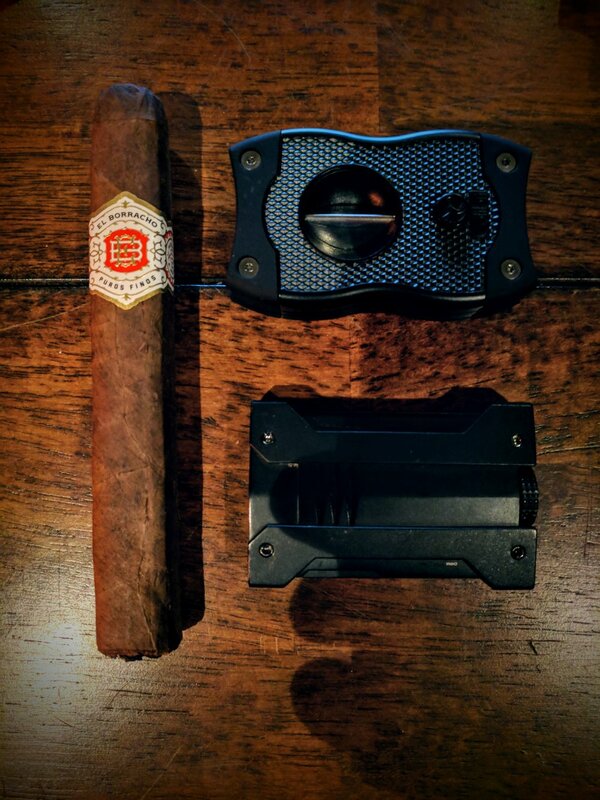 I feel this cigar warranted a fairly high rating and stand firmly behind my 9.3 - I'll be revisiting frequently and will certainly update as needed. If the burn could be better, I see this stogie going up.